Finncon 2016 is organized in the University of Tampere University main building, at the main campus. Most of the events will take place in the A Wing with some additional spaces in the D Wing. 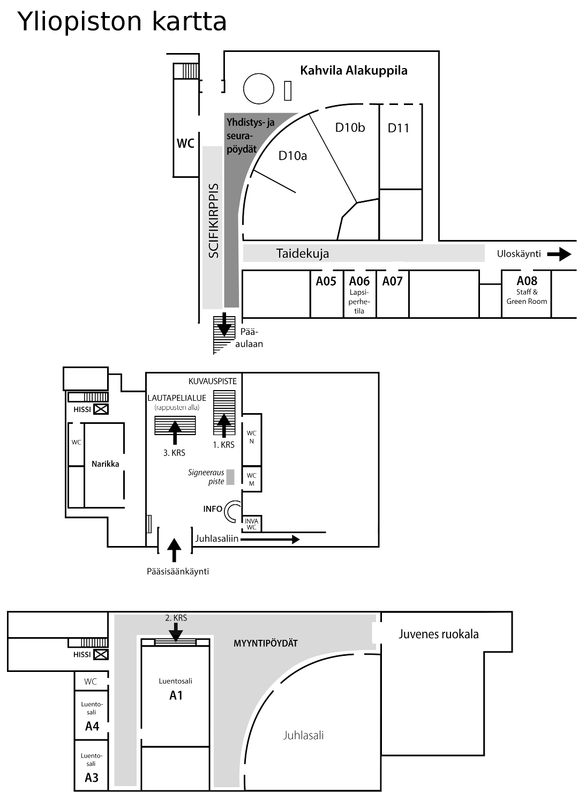 The address for the convention venue is University of Tampere, Kalevantie 4, 33100 Tampere, Finland. Here is a map of some of the most important places in Tampere related to Finncon. You can drag the map to see different areas and zoom in and out. You can see more information by clicking the markers on the map. The convention venue, University of Tampere, is marked as a green star on the map. There are lots of places for parking a car close to Finncon. At the university there is only a limited number of parking spaces so we advice you to take your car a bit further from the university. Right next to the convention site there is both Tullintori,Tulli and Hämppi parking houses and lots of parking spaces on the streets. The parking on the streets is free on Friday starting at 6 PM and on Saturday after 4 PM. On Sunday the parking is free at all times. There are more spaces on the Northern side of Itsenäisyydenkatu, in Tammela. About one kilometer from the convention site, North-East in Kaleva, there are a lot of parking spaces free of charge on the streets. These places are free of charge the whole weekend, including Friday so leaving your car in Kaleva for a longer period of time is possible, too.